A crown, or sometimes called a cap, is a restoration that replaces the outer portion of the tooth down to the gum line. A crown is used to protect a tooth from breaking, restore a tooth that is already broken, or simply improve a tooth’s appearance. Bridges are used to replace a missing tooth or teeth. They are made up of supporting crowns on each side of the missing tooth/teeth with the replacement tooth/teeth attached between them. The bridge is permanently cemented in place and does not come out. A denture is a removable replacement for missing teeth and surrounding tissues. There are two types of dentures available when people are missing some or all of their teeth -- complete and partial dentures. Complete dentures are used when all the teeth are missing, while partial dentures are used when some natural teeth remain. Partial dentures and complete dentures should be removed at night to allow tissues to breath and rest. Root canals become necessary when the nerve inside the tooth has become damaged, infected (abscessed), or painful. The process involves the careful removal of the affected nerve from within the root’s nerve canal. A rubber like filling material is then placed in the nerve canal to seal it and prevent it from further infection. In most cases the tooth is then restored with a crown to prevent the treated tooth from breaking. Local anesthetic is used to keep you comfortable and pain free during the entire procedure. Over the years there has been some concern as to the safety of amalgam fillings. Dental amalgam is a blend of elemental mercury, silver, tin, copper, and other trace elements. It has been thoroughly researched and tested. Studies indicate that there are no measurable health risks to patients who have silver fillings. The general consensus among the American Dental Association (ADA), Centers for Disease Control and Prevention (CDC) and Food & Drug Administration (FDA) is that amalgam fillings are safe and have been an invaluable treatment option used by dentists for over a century. 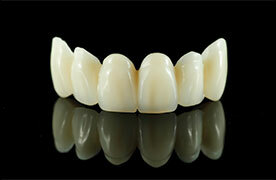 At the office of Dr. Robert E Hendry II DMD we prefer a more modern material called Composite Resin. Composite fillings are “tooth-colored” and are made of a very strong blend of quartz, glass and resins. They can be used for fillings, cracks, chips, or closing gaps between teeth and are generally applied in a single visit. Aside from being “tooth-colored”, composite resins are superior to amalgam because they are chemically bonded to the walls of the tooth. This helps support the remaining tooth structure and requires less removal of natural tooth structure. This bond helps to prevent further breakage and damage to your tooth. Composite fillings generally have a lifespan of ten years or more but, as with all dental restorations, should be checked by a dental professional on a regular basis. Dental implants have helped thousands of people regain their self-confidence and live fuller, more active lives.When someone loses permanent teeth due to accident, injury, or disease, dental implants offer a secure, functional replacement option. Perhaps you hide your smile because of spaces from missing teeth. Maybe your dentures don't feel secure. Perhaps you have difficulty chewing. If you are missing one or more teeth and would like to smile, speak and eat again with comfort and confidence, there is good news! Dental implants provide a natural look, feel and function. They can also significantly improve one’s appearance, comfort, speech, and ability to chew. Plus, Dental Implants actually save more natural tooth structure than traditional bridgework because they do not rely on neighboring teeth for support. Tooth loss or missing teeth can have far-reaching effects on your dental health and personal appearance. Dental implants offer a secure, long term functional replacement to a missing tooth or teeth, or in some cases a way to stabilize a poor fitting partial or full denture. A dental implant is a surgically placed supporting post (usually titanium) in the jawbone that serves, after adequate healing, as a foundation for a replacement tooth. 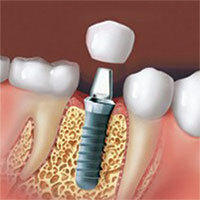 In cases where someone is missing several teeth, multiple implants are usually needed to replace the missing teeth. With over 25 years of experience in restoring dental implants, Dr. Hendry can provide you with a wealth of insight and treatment options for dental implants. After consulting with a patient seeking dental implants, Dr. Hendry will formulate a custom treatment plan based on the patient’s desires and needs. From there the patient is referred to a dental specialist who will surgically place the implant into the bone and under the gum. After a healing period between 1-4 months where the implant integrates into the surrounding bone, the implant is uncovered from the surrounding gum. Dr. Hendry will then take the necessary molds, impression, and measurements to design and fabricate the permanent restoration which is supported by the implant.